Using a caulking gun correctly isn’t rocket science, but the pros have techniques that deliver the best results. From getting the right angle on the bead to the best way to smooth it in the groove, here are some tips on caulking. Unfortunately, the only way to become skilled at caulking is trial and error. The World Wide Web hosts a wealth of information on how to lay “the perfect bead” of caulk. But, as is often the case with online help, these pages won’t often tell professional painters much they don’t already know. Nevertheless, even professionals make mistakes on occasion. And a few tips not found on the typical how-to Web site will help a painter learn to sling caulk guns with the best of them. One common error occurs before the caulk cartridge even goes into the gun: failure to properly prepare the substrate. The surface should be washed with the painter’s choice of a residue-free solvent, mild household cleaner, trisodium phosphate or rubbing alcohol — but not soap. Mildew can be removed with a specifically formulated mildew remover or a solution of one part bleach to two parts water. 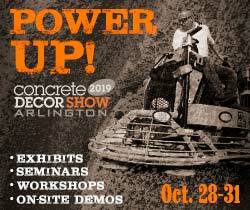 A wire brush will knock dirt and crystallized minerals off stone or concrete surfaces. The surface also ought to be thoroughly scraped to remove leftover caulking. It might also require grinding if the old caulk was silicone, as even microscopic amounts left on the surface may interfere with adhesion. A coat of primer on the substrate gives the caulk a good surface to stick to and keeps the substrate from absorbing too much liquid out of the new caulk. Inexperienced caulkers will sometimes buy the wrong kind of caulk for their job: for example, buying a nonpaintable silicone caulk when they plan to paint over the bead. But a professional contractor most likely knows enough to read the labels on caulk tubes carefully. Water-based acrylics are typically best on wood and other porous substrates, while silicones work best on nonporous surfaces such as aluminum and glass. orousness affects curing times: the more pores, the faster water can escape. Installing water-based caulk between two nonporous surfaces is not the best way to get a hassle-free cure. Also, according to Red Devil literature, a clear paintable caulk will take longer to cure and is more likely to shrink than white caulk. 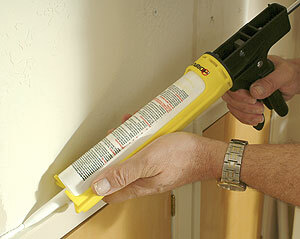 Before a tube of caulk is loaded into a caulking gun, the nozzle must be clipped. 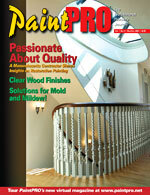 Most of the time, painters are urged to clip the nozzle at a 45-degree angle. There’s a good reason. A slant cut leaves a pointed lip on one half of the nozzle opening. 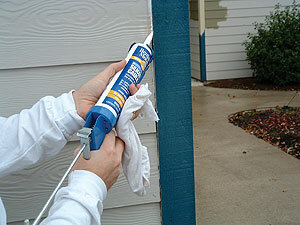 The lip directs the caulk downward and smooths it as it squirts out of the tube. A straight 90-degree cut may help in one instance: caulking corners. As to where on the nozzle to make the cut, the exposed hole ought to be slightly smaller than the crack to be filled, and the edges of the tip should straddle the joint. As the caulk exits the nozzle, it will be forced into the crack. 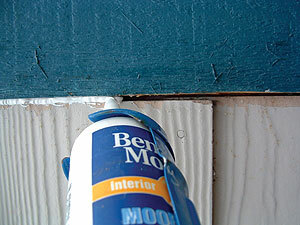 As the joint is filled, the caulk must touch both sides, but not the bottom, because if it does, the caulk will not flex with the crack as it shifts over time. Perhaps the most hotly debated question for caulkers is: Push or pull? Some experts recommend pulling the gun along the crack as caulk flows. But there are exceptions. Pulling keeps the nozzle from bumping against rough spots and makes for a smoother bead. But some say pushing the caulk ahead of the nozzle does a better job forcing the caulk into the crack evenly, as long as the surface is smooth enough to allow for it. Another old caulker’s tale is that an experienced caulker will be able to do the job without tooling. Certainly, it can be done. But caulk is not designed to flow into a gap, and tooling can be critical in making contact with a substrate. Tooling pushes the caulk into small voids and up against the sides of the joint. While several manufacturers produce specialty tools designed for smoothing beads, caulkers can do just fine with a bare finger, preferably a wet one. Many small convex instruments will also serve, such as a spoon, popsicle stick, tongue depressor, foam paintbrush, butter knife, spatula, or even an ice cube. Some recommend wetting the finger with dish detergent to avoid a mess and ugly-looking lines, but others simply use saliva. While silicone caulk may need to be pushed into a crack, latex and solvent-based caulk beads will naturally shrink into a concave shape after being flattened. The ideal bead adheres with thick sides, but absorbs expansions and contractions in its thinner middle. When tooling, once ought to be enough. Caulkers sometimes tool away too much material, Brandon says. They don’t leave enough for flexing, particularly when caulking between substrates that expand and contract at different rates, such as cedar and concrete. The best way to shape the beginning and end of a bead, Brandon says, is to use a gun that clips it automatically. “Most pros will spend the extra money for a dripless gun,” he says. Another crucial caulking factor is cold. 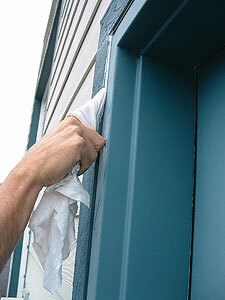 Caulks are engineered for use at a minimum 40 degrees. They can be thick and difficult to work when the temperature approaches that point. What’s more, the substrate needs to be frost-free to take caulk. If dew or rain accumulates on moisture-cured polyurethane caulk, the surface of the caulk will cure faster than the material underneath and cause blistering. To get caulk into out-of-reach areas, a straw or tubing can be taped to the end of the nozzle to create a makeshift extension. Finally, here’s an important fact to remember when caulking around bathtubs: They shift or sink slightly when they are full. A painter who caulks around an empty tub might not lay enough caulk to ward off cracking when someone uses it. So the tub should be filled with water while caulking around it. After the job, should excess caulk be saved? A large nail or golf tee will seal the tube for storage, while a drywall or wood screw will pull the hardened wad of caulk from a plugged nozzle. But sometimes buying fresh caulk is worth the money, Rumrill says. Some contractors try to use the gun to blow out the tip of the tube, but they risk blowing the piston out the back of the gun and mucking it up with loose caulk. The pressure could also scar the drive rod.